Richard Blachford, the son of William Blachford of Holway in the Parish of White Staughton, was born in approximately 1570. Richard spent his early years in the employ of Gilbert Smyth, a merchant in the town of Exeter who imported and exported goods through the port of Weymouth. Richard married Frances, the daughter of John Combe of Ashmer and started his own business in Dorchester in approximately 1593. He went into partnership with John Finn, and also with his eldest son John, importing and exporting wool and other goods through many ports between Bristol and London. Richard was a town councillor, Alderman, a member of the Company of Freemen, and Bailiffe of Dorchester. In the municipal records on the 20th September, 1606……Mathew Chubb and Richard Blachford, Bailiffes, leased a plot of Ground (land) to Thomas Bushrode, haberdasher, at a rent of 4 shillings per year. Richard’s eldest son John married Margaret Mambree at St. Peter’s church Dorchester on the 6th of October 1610. The record of the marriage appears in those of the church of the Holy Trinity. St Peter’s has no records as early as 1610, so there is some doubt as to in which church the ceremony actually took place. It is not know exactly when the BLACHFORD ARMS were granted, but during the Herald’s visitation of the counties of England in the sixteenth and seventeenth centuries, three pedigrees were recorded for the same name. 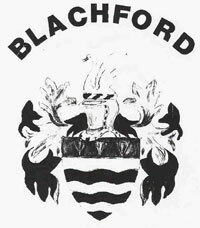 The Arms were :- for Richard Blachford of London and Dorchester, Merchant. A confirmation by William Segar “Garter”, 1629 “Barry wavy of six OR and GULES on a cheif AZURE, three PHEONS ARGENT. The CREST was a SWAN rising with wing elevated ‘GUTTEE des LARMES‘” (that is sprinkled with blue drops). At the visitation of London in 1633/34 a pedigree of Blachford was recorded. The Arms are the same as those above. This is obviously the Paternal Coat, but in this instance it impales another coat quarterly of twelve. Two crests are given. One is the swan as above; the second crest is a three tiered plume of ostrich feathers. The quartered coat of arms with the crest of ostrich feathers were the arms of the Moleynes (or Mollineu) family, the ancestors of Eleanor Waterton, wife of Richard Blachford, the third son of Richard Blachford of Dorchester. It combines the Arms of MOLEYNS, COURTE; MONTAGUE, MONTHERIER, and FRAMLINGHAM. This pedigree was collected in 1530, 1575, 1622, and 1634. Richard’s second son William, merchant of Dorchester, was admitted to the company of freemen on the fourteenth of November, 1621. A fourth son, Henry, married Maria (Mary) Bird at Chichester on the 30th October, 1629. Henry appears to have grown apart from the rest of the Dorchester family as there is no mention of his brothers in his will, although he does mention his mother Frances, for whom he showed great affection. “West lands and Tenements in West Stoke in Surrey”. Richard’s eldest son John was elected a Capital Burgess of the Dorchester Borough Council on the third of January, 1623. Francis Dashwood, son of Edmund Dashwood mercer, was apprenticed for eight years to John Blachford merchant of Dorchester on the sixth of December, 1625. From the Charter of Charles I, 29/9/1629 “A Major shall be chose from the more honest and discreet Burgesses” Richard and John Blachford were among the first fifteen Capital Burgesses, and Richard was one the first six Aldermen. Thomas Blachford was one of the first twenty four members of the Common Council. “Where as I have received a commission of rebellion, a writ of assistance, and another writ upon the statue of Northampton to disarm divers persons which are in the said commission of rebellion. These are therefore to will and require you whose names are here under written, and twenty other more sufficient persons, house holders and inhabitants of the town of Dorchester which under my under sheriff shall and doth nominate, appoint, and warn, to come and appear personally before me at the sign of the Lion in Shaftbury within this county on Wednesday next the twelth (sic.) day of this month of August, by two of the clock in the afternoon of the same days at the farthest time, and there be ready with your necessary and sufficient arms, to attend and be assisting unto me in all things diligently as becometh you and every of you according unto the said writs and my command on that behalf. Where of fail you not as you tender his Majesty’s Service, and will answer the contrary at your uttermost peril . Given under my hand and seal this eight day of August Ano 5 Reg’s Caroli (1629)” Thomas Still, Vic. Reinoldo Knapton (under sheriff) Richard Blachford (merchant) and William Whiteway junior (merchant) ‘Bailiffes’ of the town of Dorchester, or one of them to come. Henry Maber (clothier) ‘ Constable ‘, Denys Bond (merchant) John Perkins (merchant) Joseph Paty (clothier) William Paty (clothier) …etc. Thirty four more names follow. Dorchester was notorious for its disloyalty during the Civil War: (Clarendon says) “A place more entirely dis-affected to the King England had not. The town was early fortified against the King by the leaders of the republican faction. The fortifications were begun on July 20th, 1642, and carried on with the greatest activity until May 1643. Several bulwarks and forts were erected, a fort and platform at the South gate, a platform for ordinance at the West gate, works and a court of guard at the East gate, and works at the North gate, at the Priory, and at Maenbury. The Civil War began in 1642 and Dorchester was strongly Parliamentarian; though, despite its fortifications, it quickly fell to Royalist forces under Lord Carnarvon. It was soon recaptured for Parliament by Colonel Sydenham in July 1644. Oliver Cromwell was there in March 1645. Individual family records during these troubled years of mistrust, confusion and bloodshed are almost non-existent, but Richard’s part in the Civil War is recorded in the minute books of the Dorset Standing Committee. These minute books record the Parliamentary Standing Committee which sat in Dorset during the civil war and interregnum. They range from 23rd. September 1646 to May the 8th. 1650, and are probably the only examples of these books of the county committees throughout the Kingdom which have survived to the present day. The functions of the Committee were of a comprehensive character, comprising matters Civil, Military, and Ecclesiastical. Richard was elected Mayor of Dorchester in 1647. In the following year the Civil War ended and Oliver Cromwell, on the 26th of December, decided to push through the trial of Charles I. On the 30th of January, 1649, Charles was executed. Richard Blachford died in 1652, the monarchy was re-established in 1660, and by 1681 the Blachford influence in Dorchester was apparently at an end. An address to King Charles II, in August of that year, contained over three hundred names of Dorchester people, and there was not a Blachford among them. Synopsis of the book:Two hundred years before Hardy disguised it as Casterbridge, Dorchester was a typical English county town, of middling size and unremarkable achievements. But on 6 August 1613 much of it was destroyed in a great conflagration, which its inhabitants regarded as a 'fire from heaven', the catalyst for the events described in this book. Over the next twenty years, a time of increasing political and religious turmoil all over Europe, Dorchester became the most religiously radical town in the kingdom. The tolerant, paternalist Elizabethan town oligarchy was quickly replaced by a group of men who had a vision of a godly community in which power was to be exercised according to religious commitment rather than wealth or rank. One of this book's most remarkable achievements is the re-creation, with an intimacy unique for an English community so distant from our own, of the lives of those who do not make it into history books. We glimpse the ordinary men and women of the town drinking and swearing, fornicating and repenting, triumphing over their neighbours or languishing in prison, striving to live up to the new ideals of their community or rejecting them with bitter anger and mocking laughter. In it subtle exploration of human motives and aspirations, in its brilliant and detailed reconstruction, this book shows how much of the past we can recover when in the hands of a master historian.